Apple could build new notebooks that are even smaller and lighter than current battery-powered devices by switching to fuel cells for power. The prospect of fuel-cell-powered MacBooks and other devices was raised in a pair of Apple patent applications published by the U.S. Patent and Trademark Office and discovered by AppleInsider this week. They are entitled "Fuel Cell System to Power a Portable Computing Device" and "Fuel Cell System Coupled to a Portable Computing Device." "Our country's continuing reliance on fossil fuels has forced our government to maintain complicated political and military relationships with unstable governments in the Middle East, and has also exposed our coastlines and our citizens to the associated hazards of offshore drilling," the filings state. "These problems have led to an increasing awareness and desire on the part of consumers to promote and use renewable energy sources." Apple's proposed invention notes that the Electronic Product Environmental Assessment Tool, or EPEAT, has helped to increase consumer awareness of the environmental friendliness of electronic devices. In addition, Apple usually highlights the EPEAT ratings of products it introduces at highly publicized keynote events. "As a consequence of increased consumer awareness, electronics manufacturers have become very interested in renewable energy sources for their products, and they have been exploring a number of promising renewable energy sources such as hydrogen fuel which is used in hydrogen fuel cells," both documents state. 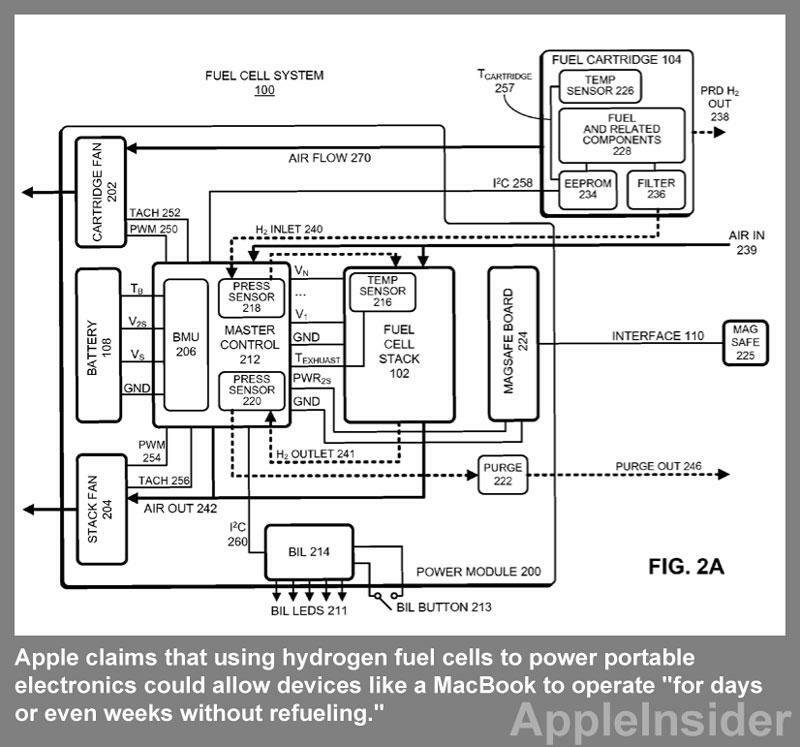 Apple then makes a case for using fuel cells to power portable electronic devices, noting that hydrogen and associated fuels could allow such devices to operate "for days or even weeks without refueling." But the company also notes there are challenges in creating hydrogen fuel cell systems that are portable and cost-effective. The solution presented by Apple describes a fuel cell system that can both provide power to and receive power from a rechargeable battery found in a device like a MacBook. "This eliminates the need for a bulky and heavy battery within the fuel cell system, which can significantly reduce the size, weight and cost of the fuel cell system," one filing reads. "This fuel cell system includes a fuel cell stack which converts fuel into electrical power. It also includes a controller which controls operation of the fuel cell system." "Fuel Cell System to Power a Portable Computing Device" was first filed with the USPTO in August of 2010. It is credited to Bradley L. Spare, Vijay M. Iyer, Jean L. Lee, Gregory L. Tice, Michael D. Hillman and David I. Simon. 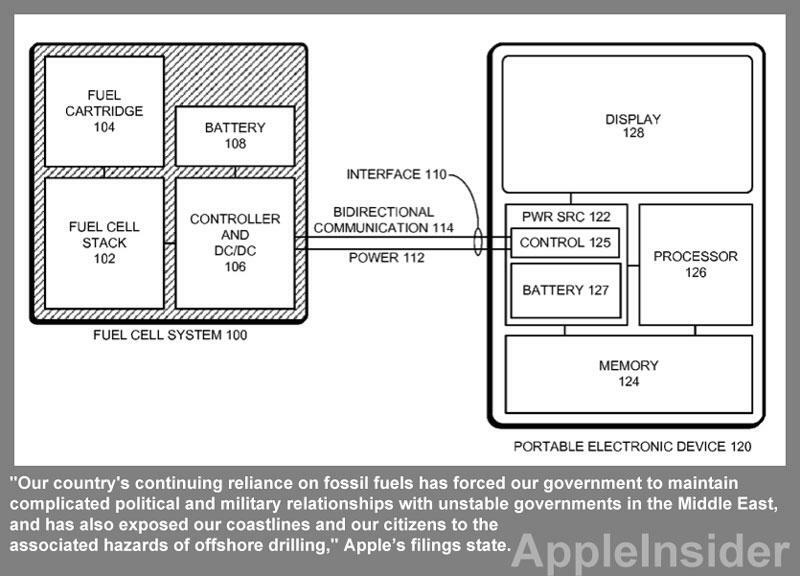 "Fuel Cell System Coupled to a Portable Computing device" is a continuation-in-part of a patent filed in 2010. It lists Iyer and Spare as its inventors. Apple's interest in fuel cell technology is not new, as in October AppleInsider highlighted another pair of patent applications from Apple that described lighter and more efficient hydrogen fuel cells. The company proposed accomplishing this by building multiple fuel cells connected in a parallel configuration by a power bus, along with a voltage-multiplying circuit to increase the voltage of the stack.